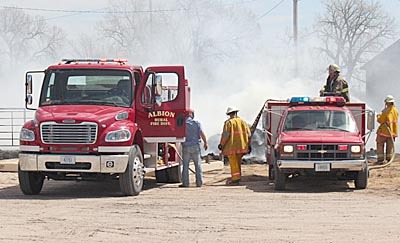 Albion Fire & Rescue volunteers were called to a smoky hay bale fire at Albion Livestock Market at the north edge of town on Tuesday morning, May 14. Smoke was pushed north toward Beaver Creek by a brisk south wind. Extinguishing the blaze took some time, as firemen had to separate and sift through the bales to put the fire out.